Welcome to the AIBA Community of locally owned businesses. AIBA is a nonprofit, membership supported organization representing more than 1,000 locally owned businesses in Austin. You’ll find your peers, colleagues and fellow business owners here—all waiting to connect with you. Through advocacy, marketing, connecting and education, AIBA promotes a thriving local business community. With each new member, our voice grows stronger. We’re glad you’re here to join us! “We’re local” gives us a geographic place but doesn’t embrace the uniqueness of this amazing city called Austin. We’re more than a location. We are a way of life, an Austin life. We’re AustinTRUE! 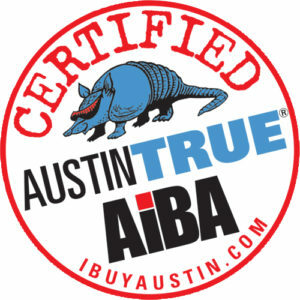 As an AIBA member, you’ll be Certified AustinTRUE. 70% Made valuable connections at an AIBA event. 75% Have utilized other member businesses as customers. 97% Feel that AIBA’s advocacy for local business is important and 54% report that our advocacy has helped their business. 61% Have directly benefitted from the community of members. Includes your listing on ibuyaustin.com and in IndieAustin, promotion of your business through our social media, website and newsletters, inclusion in AIBA special promotions, discounts from other members and co-op media buys. Includes your listing on ibuyaustin.com and in IndieAustin, promotion of your business through our social media, website and newsletters, inclusion in AIBA special promotions, discounts from other members and co-op media buys plus your logo in rotation on the homepage of ibuyaustin.com. Includes your listing on ibuyaustin.com and in IndieAustin, promotion of your business through our social media, website and newsletters, inclusion in AIBA special promotions, discounts from other members and co-op media buys, your logo in rotation in the header of every page on ibuyaustin.com plus your logo with your listing on ibuyaustin.com and in IndieAustin, and 5 boosted Facebook posts. Includes your listing on ibuyaustin.com and in IndieAustin, promotion of your business through our social media, website and newsletters, inclusion in AIBA special promotions, discounts from other members and co-op media buys, your logo in rotation in the header of every page on ibuyaustin.com, your logo with your listing on ibuyaustin.com and in IndieAustin, and 5 boosted Facebook posts plus the option to write four articles for the AIBA Blog and Community Newsletter, 10 boosted Facebook posts, your logo on the Partners & Supporters page of ibuyaustin.com and in each newsletter. AIBA is about community. As an organization AIBA does a phenomenal job of supporting their members and facilitating connections. AIBA checks all the boxes you look for in a business organization (value in marketing, local advocacy, networking, etc. ), but more importantly, AIBA is a community of businesses that care about their team mates and each other. AIBA members have fun and enjoy time around each other. AIBA is a microcosm of what we all know and love about Austin – weird, fun, innovative, savvy and uniquely Austin. Click any link above to learn more. To be eligible for membership in AIBA, at least 51% of the ownership of your business must reside in Austin and surrounding areas (Round Rock, Pflugerville, Lakeway, etc). Your business need not have a storefront but must be independent and not a franchise. AIBA reserves the right to decline membership to any business it deems not appropriate.